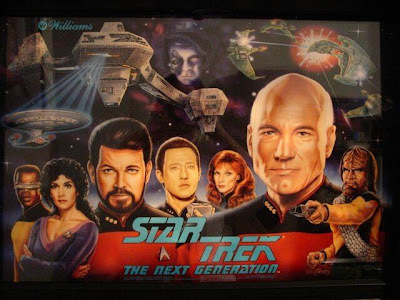 As Treknobabble's resident pinball aficionado, it is incumbent upon me to inform you of a momentous occasion: the release of Star Trek: The Next Generation as a pinball table on Farsight's pinball game The Pinball Arcade. 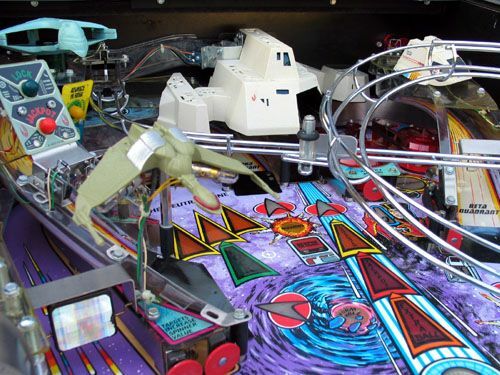 The table itself is a real pinball table released by Williams, a Chicago-based pinball manufacturer, in 1993. It's loaded with all sorts of references to the series, including ramps named after the quadrants of the galaxy, missions named after characters like Q and the Ferengi, and prop pieces depicting ships from the series including the Borg thing from Descent, a shuttlecraft, and a Klingon Bird of Prey. It also features real theme music and sound samples from all of the main actors of the series! And I don't just mean stuff from the shows. Counselor Troi says "I sense a lit Extra Ball." When the ball drains, Data says "Had you aimed the ball at the proper trajectory, you would have been rewarded." And so on. The table has loads of different modes, many multiball scenarios, and is just a lot of fun to play. So, suffice it to say, as pinball tables go, it's quite a bit of fun. As a video game, it's also pretty darned good. The table can be had for $5. You download the Pinball Arcade game for free, and then buy tables to add to it. You can also play the table for free in a demo mode that ends after you reach a certain score (for me, this takes about 3 minutes, but your mileage may vary depending on how bad you are at pinball). So it's easy to try and see if you like it. Pinball Arcade is available on PS3, PS Vita, Apple IOS, Android, and Xbox 360. As of right now, the TNG table is available on all of these platforms except the 360. I own the full PS3 and Vita versions myself, and I've played the IOS version on my wife's iPhone 4s, and the Android version on an Acer Iconia tablet running Ice Cream Sandwich. The graphics are great on all three platforms, with by far the best being on PS3. The IOS version runs a close second (I was quite impressed), with Vita being the third best. I imagine performance will take a slight hit on tablet and phone devices that are a bit older (e.g. previous iphones, older tablets). It was a tad slow (but still playable) on my Acer Iconia A500, which is about 2 years old. For an investment of $5, I think any serious TNG fan who is also a casual gamer will get a lot out of it. I heartily recommend it.